Yale Endowment – a Levered 60/40? In Yale’s 2017 annual endowment report released last week, CIO David Swensen and his team give a lot of credit to the role of active management for Yale and other top performing endowments’ superior returns relative to the market and a balanced 60/40 portfolio over the past 20 years (along with portfolio diversification, equity orientation and a heavy allocation to alternatives). For the second consecutive year, the Yale report also rebuts Warren Buffett’s 2016 Berkshire Hathaway investor letter that “financial ‘elites’”, including endowments, are better off investing in low fee index products and not “wasting” money on active managers’ hefty fees. We did our own calculations and here’s what we found1. What catches one’s eye when reading through the Yale report is that it’s about returns – pure performance. While the word “risk” is discussed in the forecasting section (section 3, “Investment Policy, Asset Class Characteristics”), interestingly, it is never mentioned when assessing historical performance and comparing it with benchmarks (section 5, “Investment Performance”). That seems a little strange for anyone vaguely familiar with MPT, especially when “superior risk-adjusted investment results” are also being touted by Swensen2. So, there’s a piece of the puzzle that has to be recovered, something that is hidden between the lines (or should we say – between annually reported returns?). 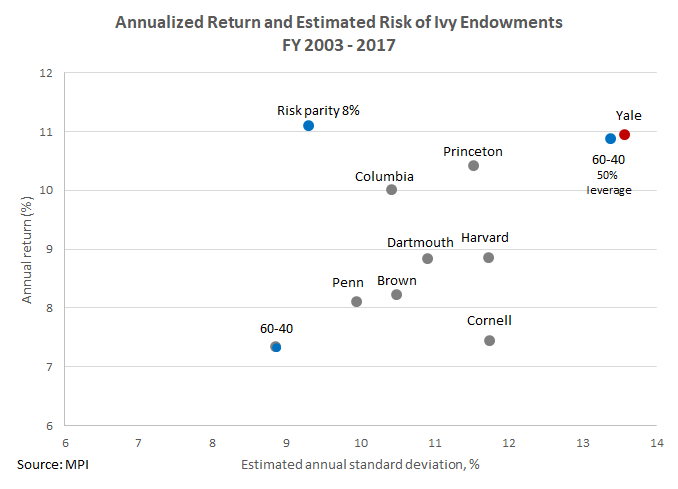 Using the methodology that we briefly outlined in our recent post and our upcoming paper, we find that Yale’s superior performance as compared to other Ivies and a 60/40 proxy could be explained primarily by its much higher estimated risk. In terms of portfolio efficiency (Sharpe Ratio – estimated using our methodology), Yale trails Columbia and is similar to the Ivy average and the 60/403. So, when things are brought to the same common denominator – risk-wise – we estimate the Yale endowment performs (after fees) on par with a leveraged version of the 60/40 portfolio and underperforms an auto-pilot Risk Parity portfolio4. Though we believe there is a role for alternatives and active management in a portfolio, when we factor in risk to the Yale endowment performance puzzle, we’re on the side of Buffett in this duel. 2“The superior results of Yale and a number of peers strongly suggest that active management can be a powerful tool for institutions that commit the resources to achieve superior, risk-adjusted investment results.” Page 20. “Active Management of Endowment Assets”. 3The analysis is performed using annual Yale returns only over the past 15 years, as this was the common period of dates for our Ivy endowment data study. It’s worth noting that Yale has done extremely well after the Financial Crisis, but due to the illiquidity of the endowment’s private investments it’s important to include crises in any comparative calculations. Severe downturns present the “moment of truth” as it were, when such illiquid assets are marked to market. 4A risk parity index with an 8% volatility target that utilizes major asset classes (equity, commodity, fixed income, credit).